On the night of November 13, 2015, cowardly criminals from the ISIS gang carried out coordinated attacks against innocent people in Paris, France. So far, 136 people are confirmed dead, and many more remain wounded. Image by Annie Harada Viot, public domain. Before examining the effects of the attacks beyond the casualties, Piper and I wish to offer our respectful sympathy to all the families that lost loved ones in the attacks. We also wish to assure the people of France that civilized people throughout the world stand in solidarity with them. 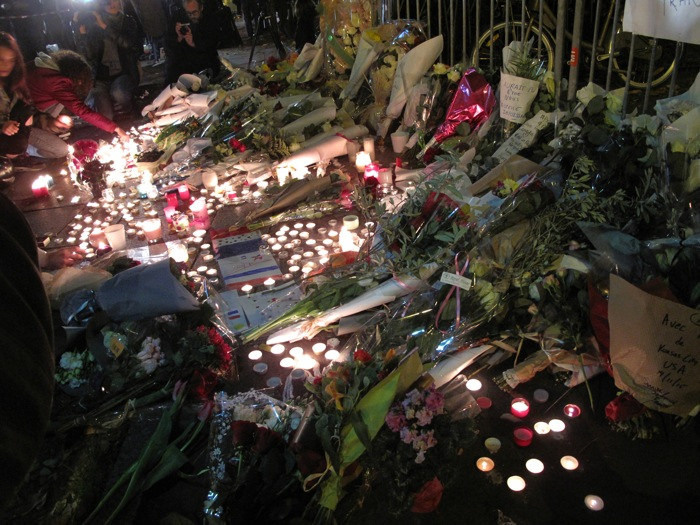 It is easy to see why reasonable people might view the Paris Attacks as a “success” by ISIS. ISIS got attention, and its vainglorious leaders lust for that. They hurt France and, by extension, all French allies and sympathizers. The attacks were a tactical success in that, while they likely killed far fewer people than the ISIS head-monkeys had hoped for, they killed more than enough to justify their efforts in tactical terms. All this notwithstanding, I view the Paris attacks as a gigantic failure on the part of ISIS. That’s because the violence in France does not, and will not, support ISIS’s goal of extending its control over more Middle East territory. It certainly doesn’t get the group closer to its stated goal of worldwide Islamic rule. The Paris attacks have already resulted in increased French air strikes against ISIS assets in the Middle East. As for ISIS assets in Europe, France and other European nations have redoubled their efforts in rounding up the ISIS vermin that have been roaming free across that continent. If you are an agent of ISIS in Europe, your life is more difficult this week than it was last week. Those seventy-two virgins are closer than you think. This does not mean that ISIS is incapable of carrying out further attacks in the West. It is never difficult for criminal enterprises to recruit the losers in any society. But since the latest attacks, Europeans will be more willing to tolerate increased police activity and higher military budgets. Those higher military budgets, coupled with increased Western willpower to use military force against ISIS, will equate to a higher rate of vaporization of ISIS thugs across the Middle East. If anyone disagrees with this theory, please note the ISIS casualties these last few days in Syria and North Africa. It’s not a good time to be waving an ISIS flag. So then, why would a group that claims to be the rightful rulers of all the people on the planet be so unwise as to carry out the Paris attacks? One critical element of the answer is stupidity. No sane, intelligent person would join ISIS, let alone try to lead it. Lots of types of individuals might join ISIS, but one of the common traits they share is an inability to reasonably perceive reality. Even those that join because they wish to rise in personal status from unemployed dishwasher to “badass terrorist gun slinger” must be intellectually deficient in order to volunteer for life as an ISIS gofer. Being the lead lowlife in a group like ISIS is, at best, a short-term thrill. Being at the bottom of the lowlife heap must be hellish. We are not dealing with a collection of 25,000 brilliant scholars. We are dealing with heartless, bloodthirsty idiots. And they will fail. Thus far, with minimal effort by the US and far less serious efforts by a few of our allies, the ISIS Middle East blitzkrieg has been halted. Keep in mind that Western efforts have amounted to airstrikes against ISIS targets, pathetically small assistance to the Kurds, a mammoth infusion of cash and arms to that vaguely defined troupe of hapless clowns that we so generously call “the Iraqi Army,” and minimal efforts at helping independent Syrian rebels. We will not at this time delve into any possible covert actions that may have occurred against ISIS. Thus far, the airstrikes have been partially effective. Some in the West have called for a more robust bombing campaign against ISIS targets, but that’s a topic for another discussion. The under-armed, outmanned Kurds, now assisted by a few poorly-armed Yazidis, have been very successful in their struggle against their well-armed ISIS opponents. The fact that the Yazidis and Kurds are willing and able to cooperate with each other is further bad news for the despised ISIS. Our wildly expensive efforts with the Iraqi Army have resulted in little more than accidentally supplying ISIS with weapons, ammo, and equipment. Our efforts at assisting Syrian rebels have yet to yield meaningful results. And yet, with such minimal effort by the West, ISIS has been stalled. What about ISIS’s many friends across the Middle East? They no longer have any. Thus far, the ISIS Middle East Foreign Policy Initiative has consisted of creating steadfast enemies in Jordan, infuriating the Egyptian government, and declaring war on Hezbollah in Lebanon, thus earning the always generous hatred of the Iranian Shia junta. All of this has been done without them initiating their most important battle – their “coming war” against Israel. Even by the low standards of ISIS logic, the Paris attacks were a foolish move. ISIS’s future has never been bright. This week, it’s dimmer still. À la ferme porcine avec ISIS! Such good points on the recruiting front. An encouraging post on such a macabre topic. Hello LBushman. Glad you like it. thanks for your visit. If ISIS leaders can claim any victory, it is the publicity they received. As for recruiting, the number of dunderheads that would volunteer to enter the maelstrom of the inevitable retaliation by the West has to be a pathetic few. If the West needed to be prodded to take more substantive stabs at ISIS, that possibility just became a reality. Bingo! It would be nice if more civilized methods were effective but they generally are not. Consider that ISIS has a different strategic objective besides just attacking the West – retaining people in Syria. Since the attack most nations are closing borders and reneging on accepting Syrian refugees. They are running short on people to oppress and hide behind. At some point, all that will be left in Syria is open desert and ISIS targets for western air forces. Hi Greg. You make a good point. I hope that some day normal Syrians will have control of Syria. Another great commentary, Holmes. Bonus points for giving a few really good laughs in the process. Hello Ms Spann. Thanks for the visit. By the way. I love your books. You have a very crisp style and your plots are very unique. Beautiful assessment. The whole ISIS event cycle is instructive, I believe, in a cardinal shift that has to occur in military thinking. For ages the “army” was the weapon of choice for nations, but those were often battles over land, justified by ideals. What we see here are collections of idealists, twisted by unstable minds in lands ripe for strife, and while in reality a ragtag collection of anti-social outcasts — they would still represent a serious threat to an organized military ground action, both in terms of attrition cost and budget value. However, air strikes used in combination with specialized forces, could achieve a game-ending impact on the operations of a guerrilla-style group, such as ISIS. It is little more than fighting a raging fire with a highly-concentrated and disciplined fire. Simple logic. Anyway, brilliant article, Holmes. Always glad to see your words. Hi Gene. Thank you for your thoughtful response and your kind words.